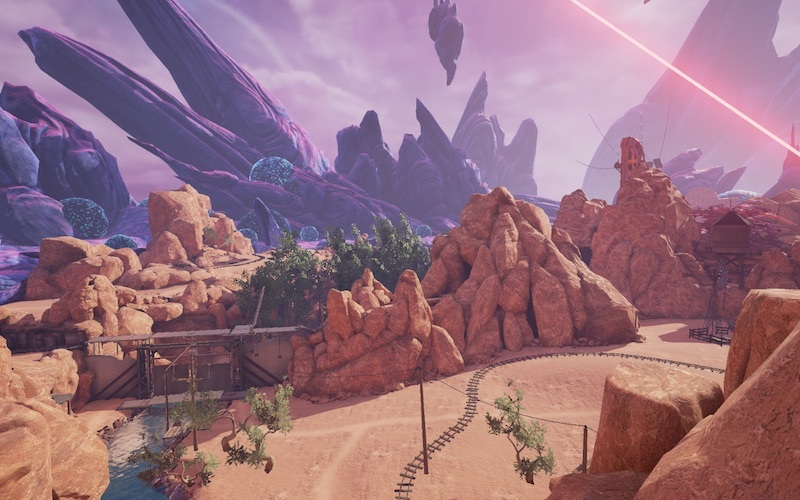 Welcome to the Obduction walkthrough. Like all walkthroughs, use it to help but take the time to explore yourself, you will discover much more on your journey than what is detailed here. Before we begin. This walkthrough doesn't have lots of images. Images can spoil the game as you get to see all the surprises too early. 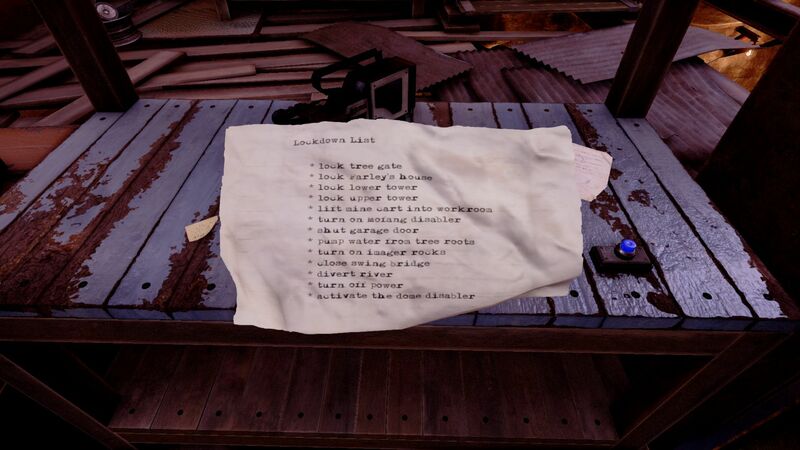 This walkthrough tells you where to go and what to do but lets you make all the discoveries yourself. It's dusk when you arrive at the lake. Follow the path round the left heading for the campfire. Listen to the story and watch the lights. Keep going until your way is blocked. A light appears and a seed opens and you are obducted. When you arrive you are in a spherical cave along with the part of the picnic area. Interesting. Exit along the cleft until you reach a sign saying 'Welcome to Hunrath'. Press the blue button and listen to the welcome message from Joseph. Continue forwards and keep going across the rail tracks until you are in front of a house. Notice the circular border. Open the mailbox and read the note from CW. Note the house number on the post. In the garden is a sign for the 'Farley Community Center'. Press the button and the message is hijacked by a warning from Farley. Next to the house door is another warning. Face away from the Farley house. Off to the left is a cemetery and a rail track heading into a mine tunnel. Go take a look. Head back along the tracks to where they cross and go left. 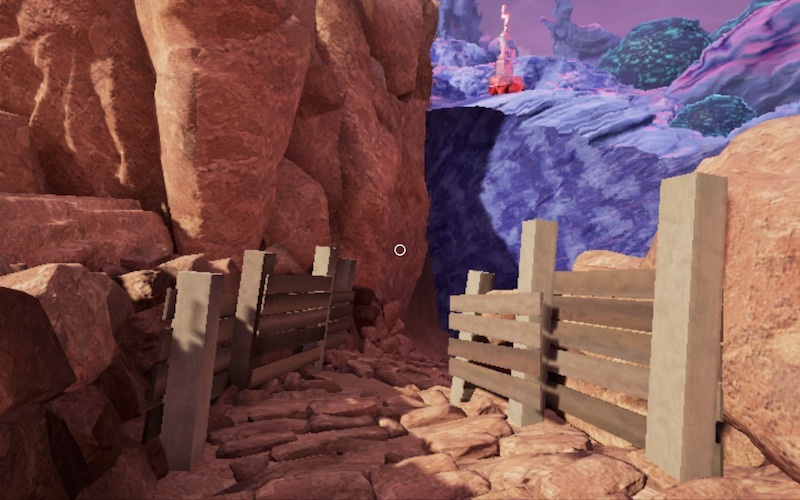 Stop and open the gate and note the glowing rocks blocking the mineshaft. Ouside the gate you can see the edge of the area - that purple wall looks like you should be a able to pass through. Follow the rail track back to the crossing and note the rail track on the left blocked by some more glowing rocks. Follow the tracks through the gap on the left and into Downtown Hunrath. Ahead of you are some steps leading up and another messenger. Learn about the tree that is behind the wall. Note the water tower and pipe going over the wall. Above you is a rail track and a walkway leading to the water tower. The tree looks a bit dry (hint hint). Round the back is a gate into the tree compound and a door in the wall. Back down into the town. Go to the messenger, listen to the mayor again. Enter the nearby building and look around. Note the spherical rock in the alcove. To the side of the house is a rail tunnel blocked by the same spherical rock. Head through the town past the red and blue beams towards the river. 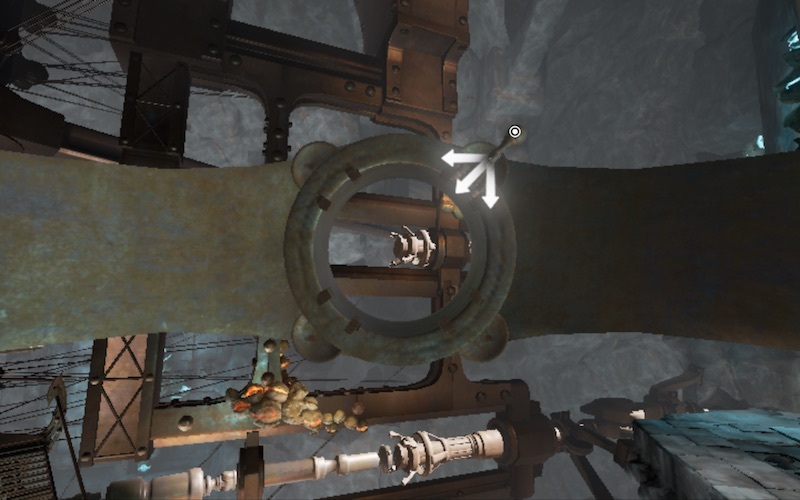 There is a lever connected to the river gate. Note the walkway up above the river gate. Across the river is a door. Go left along the river and there is another messenger but no waterfall. Once you have found everything and heard all the messages go to the red lazer pointing at the sky. Note the blue beam at the entrance to the compound. Enter the compound and go into the house on the right. Press the green button and meet CW. It seems you need to power up. Go out the side door and follow the walkway to the lift. Pull the lever and go up. Down the stairs is the Mofang device with the red beam. Up the ramp is a rock bridge that leads to the membrane (you won't be back here for a long time). Turn round and go the sluice gate. You also get some views of Hunrath and a glimpse of the area the other side of the river gate. Pull the lever to divert the water to the waterfall. Back down in the lift and leave the compound. Go to the river gate and pull the propeller down on the right. Go to the lever on the bank of the river. Pull the lever and the river gate rotates opening up a new path. Head down this new path along the river. Note the huge stone sphere on the right supported on three motorcycles and a circular track. Don't press the button! 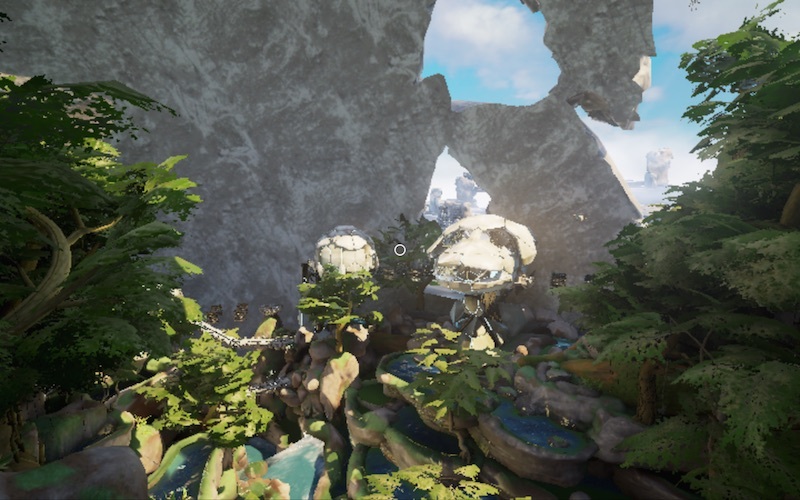 To the left of the stone sphere is a ramp to a locked door. Walk onto the rail-yard. It's circular again. This seems to be a pattern. Go to the generator car and up the ramp. Switch the generator on and flip the red switch down to block the fuel drain. We now need fuel. Follow the fuel line all the way to the garage forecourt. Wind the handle to pump some fuel. Back to the generator. Check the gauge now says full. Slide the cover to the left. Turn and hold the switch to prime the generator. Release when the sight glass is full and the lamp turns amber. Turn and hold the switch to run, the generator should burst into life and the light go green. Follow the power cables and you will come to a distribution board that is mostly green lights. If you want to do some more exploring go to the door at the rear of the rail yard and follow the paths. Follow the river back to the compound and talk to CW. He mutters on about the red beam. 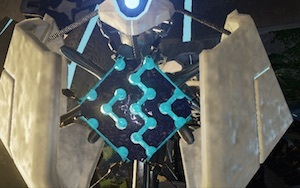 In the compound is a door with a red button. Open the door and go up the stairs to CW's workshop. Play with the machines and read all the notes. In particular note the lockdown sequence, door code and information about the swap machines and the Villein device. Stand behind the cart with the blue beam that is above your head. Press the button to lower the cart. Before you head down to play with your new toy follow the rail that heads out across the valley floor. Towards the end is a bridge on the left leading to the water tower. Flip the lever to turn on the water to the tree compound. Return to the workshop and go up the ramp on the left. This is the battery. Open the cover, read the note and engage the battery if you are so inclined. Down the stairs and out the building. Round to the left is the cart you lowered. The blue beam won't hurt you. Go to the cart door and click to enter. Up on the right is a green switch to swap between the Villein device and the drive motor. Flip the switch up and move the lever on the right to go forwards. Drive out the compound to the first set of points. Swivel round (face the rear) and flip the points lever to the right track. Reverse towards the river (you will get used to this). Stop when you have a clear line of sight of the Mofang device. Flip the green switch to activate the Villein device. Use the joystick to move the beam generator until the red beam is centred in the screen. Press the blue button to fire. You may need to adjust the position of the cart or your aim but when you get it right the Mofang device is destroyed and the sky clears. Turn off the Villein device and drive through the town. 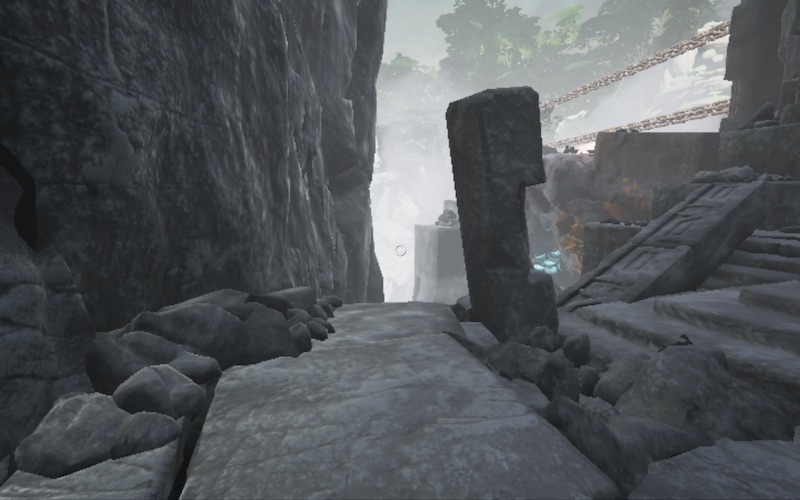 You will end up in the tunnel where your path is blocked by the stone sphere. Face the rear and change the points to reverse onto the right track and then the left track until the steps to the tree are on your left. Use the Villein device to smash the glowing rocks on your right and open the tunnel. Turn off the Villein device and go forwards to the points, face the rear, reverse onto the right track and then the left track until you are stopped by another rock fall (don't go through the tunnel). Check the points are set to the left track and go forwards past the cleft where you arrived and stop near the gate on your right. Exit the cart and open the gate (if you haven't already). Up the path are more glowing rocks. Back to the cart and manouver until you can aim the beam at the rocks. Blast them out the way. Exit the cart and head up the path and into the tunnel. Walk through the membrane (faster than a linking book) and into the scrap yard. Follow the path past the containers until you reach a junction. The left path leads to an inaccessible ramp. The right path leads to some wooden steps (near the silver whale). At the top of the steps is an excavator bucket on the left that carries you down and across the river. Leave this for now. Follow the rail track until you get to a locked gate. Open the gate. If you follow the rail track you end up near the cemetery. There are also some shafts to the side with something down below in the darkness. From the scrapyard gate take the rail track to cliff edge. At the cliff edge look down and you can see the river and some more glowing rocks on the right. Lets smash 'em. Turn round and go through the membrane and you will be back to where you left the cart. Reverse the cart back to the blocked mine, change the points to the right track and go forwards. At the next points turn round and set them to the right to go through the tunnel. Stop at the Farley house, head off down the left track and into the tunnel. Through the membrane and keep going to the scrapyard. Round the loop and out the gate. Go left towards to the cliff edge. 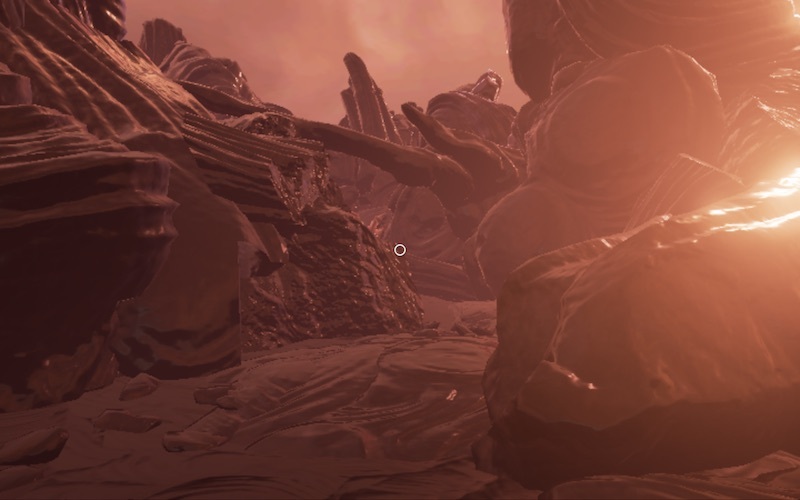 Use the Villein device to destroy the glowing rocks. 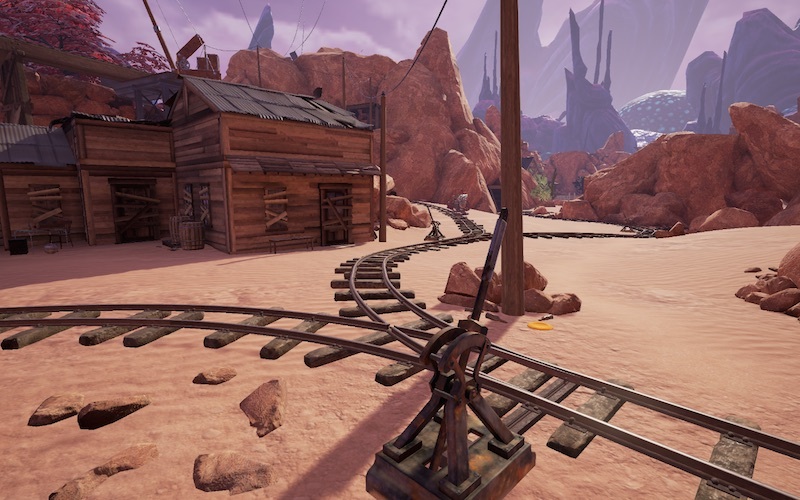 Reverse the cart back round the loop, flip the points to the right and reverse back to the mine tunnel. If you don't go round the loop you will end up facing the wrong way for a later task. 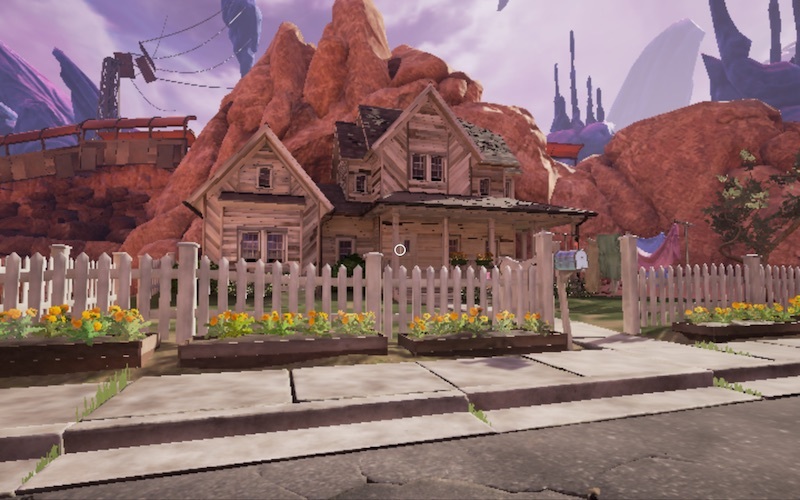 When you get back to the Farley house flip the points to the right track and head back into town. Stop at the building with the blocked tunnel and get out the cart. The Villein device should be facing the tunnel. Walk to the river gate and return to the rail yard. Through the doors and up the path to the entrance on the right and the locked door. You got the code clue in CW's workshop. It's the Farley house number in reverse: 6341. Inside there is lots to read, listen to and look at. Take note of the various races in the documents on the desk. Listen to the stories on the tape recorder. Turn on the projector and aim it at the Hunrath map. Note the ring location on the wall. Rotate the projector to the right, change the slide and pull down the projector screen. Note the pattern of dots and the number 15. Close the rear door and you will find a tunnel. At the end your path is blocked by another grey rock sphere. Back up to the house, unlock and exit through the front door. Head to the any of the membranes on your left to get to the scrapyard. Go to the excavator bucket you found earlier. Jump inside and press the button to descend to the storage compound. Down the ramp and turn left. On the fence to your right is a power cabinet. Energise both circuits (handles up). Go into the garage and examine the alien looking machine. Remember the pattern of dots in the Farley house? Recreate the shape by joining the dots then press the button. The number 406 appears on the cash register. Might be worth remembering this. If you enter numbers on the cash register and press the RH key you get patterns on the alien machine. If you persist you will discover a base 4 pattern. There is a worksheet on the table behind you to practice with. Open the roller door to access the forecourt. Note the registration plates on the wall. A picture would be nice (they change for each new game). Go to the the river gate and close it by pulling the propeller down on the left and moving the lever on the river bank. Go to the Farley house and out the back to the path with the stone arch. Follow the path and go through the membrane. If you are inquisitive you can play with the machine. I won't spoil the surprise. Press the button to drop the ladder into the scrapyard. Back up the path and through the membrane and go forwards to the river gate upper walkway. Cross the bridge and pull the lever to lower the stairs. If the river gate is still open go back and close it now. Keep going along the path until you reach an elevator with a telephone type thing on the left. In front is an elevator shaft going up the tower and down to a room. As you can't do anything just yet return to the river gate, enter the tunnel and go through another membrane. Climb the steps and onto the dividing wall. 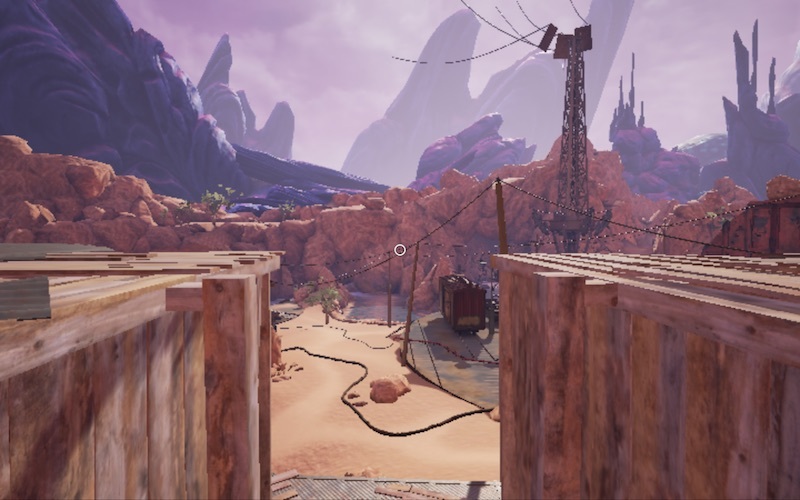 On the right is a mesa with another sphere. If you are inquisitive you can play with this machine as well. At the other end of the mesa is the rock arch (now a bridge). Return to the dividing wall, go right along the path and you will end up at a locked door. Open the cover and use the only code you know: 406. Inside the Mayor's House read all the notes and whatevers. On the desk examine the two compasses. The one in the box has a US State marked on the bottom (the clue was written in blue in the journal). 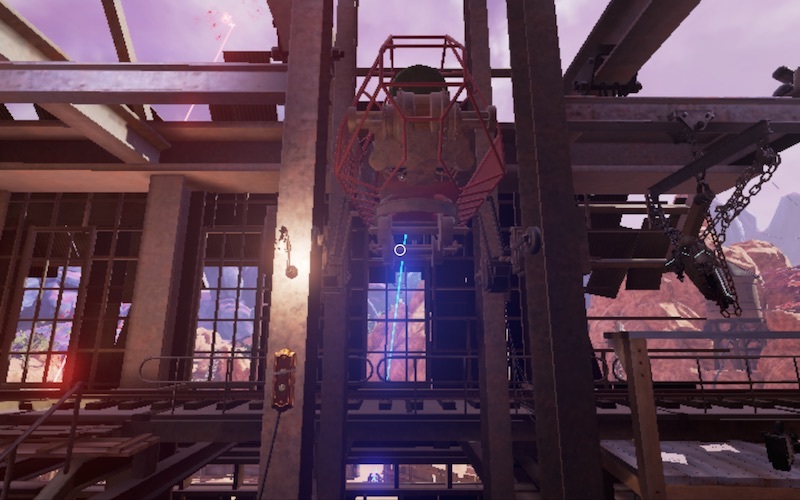 There is an elevator that doesn't work yet but it goes up the tower. To the telephone thing. Open the two doors. One leads to the rear of tree compound, the other leads to the massive stone sphere. Go to the ladder you dropped by the river gate and climb to the top. At the top of the walkway go left along a narrow path until you get to the elevator. On the left is the telephone thing. Remember the license plates on the wall on the garage and the name on the compass base? You need to translate the license plate number into a telephone number. I got Rhode Island with the registration CLU287. This translates into 258287 (C=2, L=5, U=8). Dial the number and when you get a green light, call the elevator and go up. You have a wonderful view of Hunrath, TV screens and some sort of monitoring panel with four locations: Hunrath, Maray, Mofang and Kaptar,. Outside is a detonator that seems connected to the bleeder you read about in the Mayor's house. Go down three levels into the cellar. Go into the alcove and wind the handle to open the gate. Back up in the elevator and out the door to the tree compound. Go down the tunnel into the roots. When you get to the bottom flip the lever to turn on the water. The tree comes alive! Note the three exits into space. Climb back up and exit the tree compound. You are just about done here for now. But there is one more bit of preparation to make things easier later. Go to the river gate and pull the propeller down on the left. Go to the lever and switch to the left. The gate will open but now with the walkway connecting the left bank. Time to go play with those mysterious machines (if you haven't done so already). The first place to go visit is Kaptar. Farley house > under the arch > through the membrane > through the small membrane > follow the path. Farley house > rail-yard > garage > store > up the excavator > up the ramp. Cemetery membrane > follow the rail > scrapyard > up the ramp. Stand in front of the swap machine. Pull the handle to the right to activate then press the button. Not quite a Myst linking book but just as much fun. Feels chilly. A bit like Spire. Go up the steps and look up, you can see an elevator far above. Turn round and cross onto the bridge. Go down the steps on the left. Turn the wheel and look up to see the turbine start to rotate. 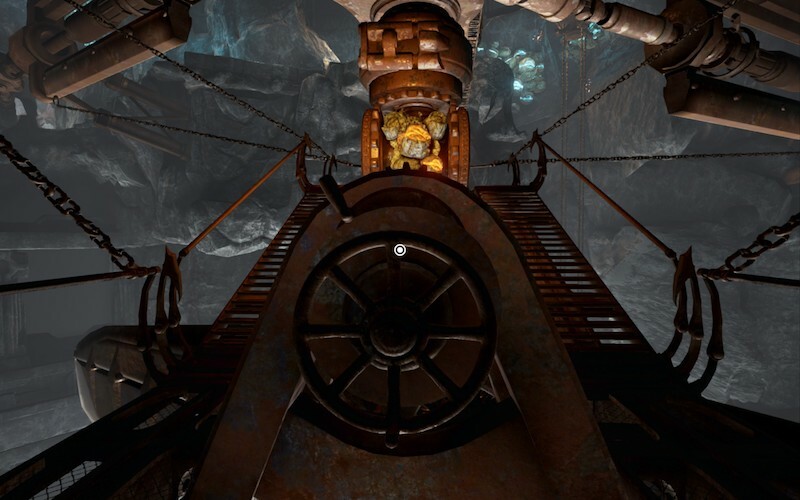 Climb back onto the bridge and move the lever to the right to rotate the bridge. Cross to the other side and drop the arm with the red cap. Follow the cliff path all the way down (it's a long way). When you arrive at the plaza turn right to face the huge machine and the tree. On your right is the entrance path and some stairs leading up. On your left are some stairs stairs leading down and a path to a glowing sphere. Follow the stair down and along the path to a metal channel with your way blocked by a huge hook. Back up to the plaza and keep left to the short path leading to a glowing sphere with the red beam behind. Inside is another swap machine. Through the window you can see the red beam. On the wall is a map of Kaptar. 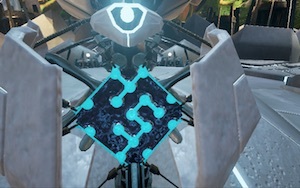 I know of only one way to destroy the Mofang device but it's back in Hunrath. Use the machine to swap back to Hunrath. You should hopefully recognise where you are. Leave the building and go get your cart. 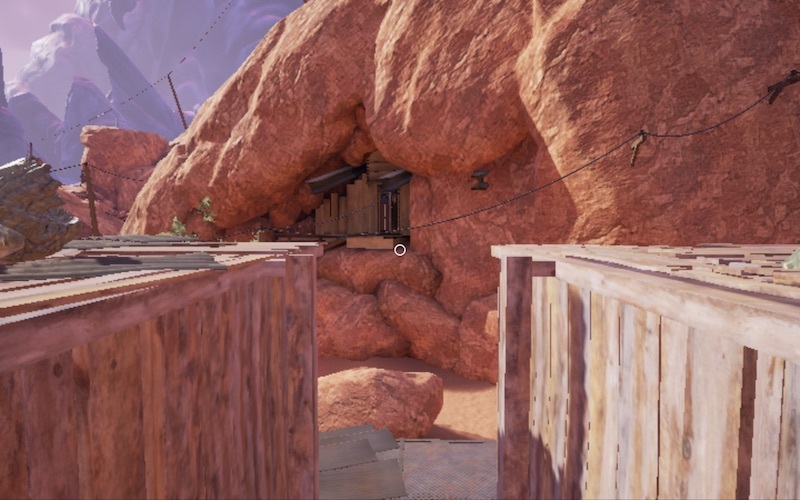 Drive it into the tunnel behind the house you just left. Note: you need to drive forwards, the gun must be in front of you. The stone sphere has gone (it's back in Kaptar) and you can reach the machine through the window so swap back to Kaptar. 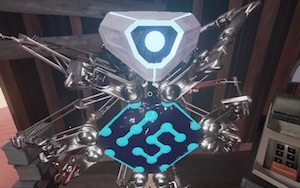 Back up as far as you can go, activate the Villein device and aim it at the Mofang device. With a bing bang boom it's all gone and if you look up you can see the sky clear. Link back to Hunrath, drive out the tunnel go into the building and link back to Kaptar. You need to get everything working and that means power. Leave the dome and go back to the plaza. Across the other side you will see some stairs just to the left of where you first entered. Start climbing. It's a long way up. You will arrive at another huge machine. Keep going until can see a walkway up above with a ladder ready to be dropped. Just past this is an entrance to the left. Inside is a massive cavern with ginormous turbine down below and lots of wind. On the edge of the chasm behind the locked control plinth is a walkway leading out to the turbine. Go all the way down to the very end. Face the machine and move the lever at the top. This engages a gear. Now turn the wheel to unlock the turbines which begin to rotate. Go up one level and turn the wheel to engage the main drive. Everything begins to clank away so it's all good. Climb back up to the top and go up the ramp to the control plinth that is now unlocked. Click on the ring and you will discover you can move the lever in three directions (hold the end of the lever). Horizontal and vertical directions move the ring to different drive shafts. Diagonal engages the drive shafts. You need to engage all four drive shafts. Top left: elevator on your left. Top right: elevator down a path to your right. Climb down off the plinth and follow the path down to the elevator. Pull the lever and descend back to where you first arrived. Pull the lever to call the bridge. Go to the centre of the bridge and move the lever to the right twice. Go through the membrane. Climb the steps to the machine and pull the lever to ride the chains back to the plaza machine. If you look down you will see the hook travel in the opposite direction. At the machine, go down the first ramp and look down. 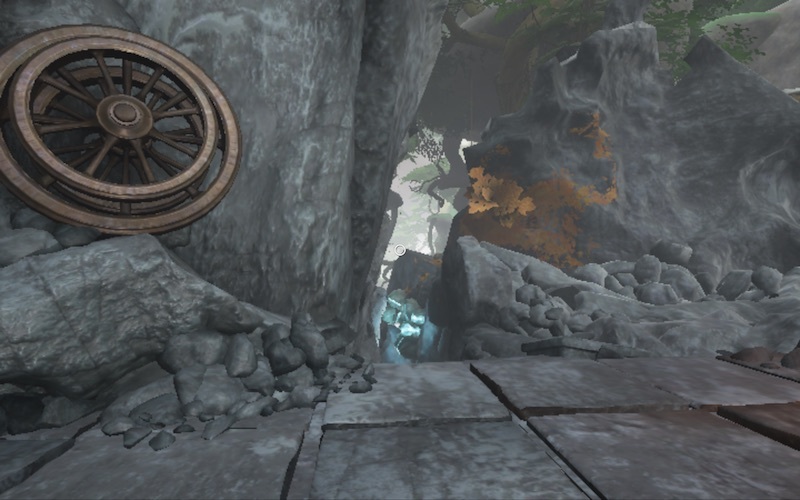 You will see a spinning drive wheel blocking the path to the tree. Continue down to the plaza and go to the steps on the far right leading down to the hopper. Now that the anchor has gone you can climb the stairs to the temple. There are four sets of stairs (2 each side). Go up the right stairs and keep going to the right. At the end you can look down and see the path to the tree. All you need to do is find a way to get there. Key thing to note is it's below the temple, you need to go down. Turn round and keep the wall on your right. You will come to a tunnel with a locked door at the end. Back to the temple down the stairs and up the other side. Up the ramp and across the green sphere and keep going all the way. You will see Arai skeletons. At the end cross the membrane. Climb two sets of stairs and you will realize you are now on the other side of the gorge. Keep going up one more flight to reach a chamber with a swap machine. Pull down the cover and press the button. You may have already been here. If so you will recognise the path down below and the sealed door. Go to the door controller and break all the links. Press the button and the door below you will open. Since there is no other place to go use the swap machine to return to Kaptar. Climb the stairs until you reach a small platform (with the golden rocks). There is a gap in the rocks on the left leading down. At the bottom is a small cave with a swap machine that takes you back to Hunrath. Explore the room and read the books. If you leave the room you will discover where you are. Did you find the Myst books? In the journal is a highlighted note about CW's battery plan. Climb back up to the small platform and keep going up. At the top follow the path and go through the doorway on the right to another chain transporter. Pull the lever to ride back to the powerplant. Climb down twice and wind the handle to lower the stairs. Go to the power plant and disengage the lower left drive shaft. This will stop the wheel blocking your access to the tree. Back up to the walkway and round to the elevator. Ride down to the bottom and up the ramp into a spherical cave. Note the two exits on opposite sides. Climb up the steps to a locked door (again). Back to the swap machine and return to Hunrath. Recognising where you are your task is to rotate the sphere 180° so you can get to the other exit. Take note of where the ramp is pointing. Climb down and go down to the motorbikes. Press the button 4 times. Go back up and climb the steps to the top. Check you are now pointing in the opposite direction. If you got it right the stairs are now aligned with the other exit. Can you now see a lower exit? That might just take you beneath the Temple. Up the steps, follow the tunnel and unlock the door to the temple (it's not necessary but helpful just in case you need to return). You now need to align the entrance ramp with the lower exit. Link to Hunrath. Rotate the sphere two more times. Check the direction. Go down the stairs and into the tunnel. On the right near the wooden fence is a tunnel to the locked door which you can now unlock if you want. Enter the Arai breeding cavern. Straight ahead and down the tunnel is a broken swap machine and a Mofang body. Back to the cavern and turn left. 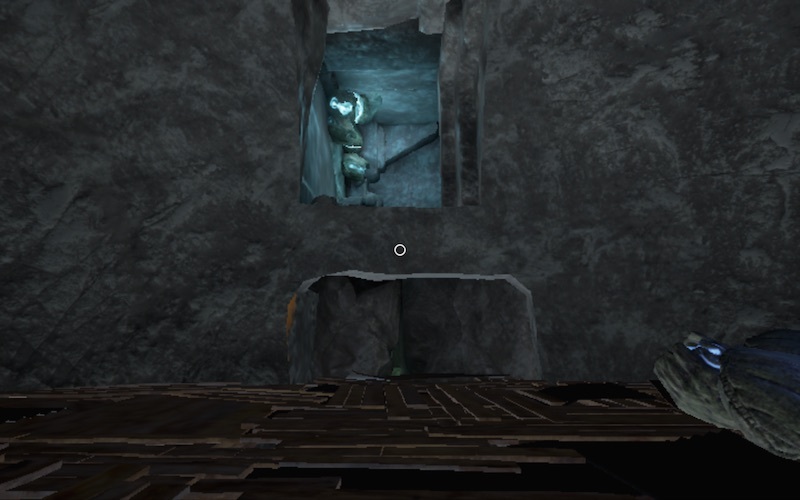 Keep going round the cavern and you will eventually reach the tree. If your way is blocked by a spinning wheel you need to return to the powerplant and disengage the lower left driveshaft. Head down into the tree and turn on the water. Follow the hose back to Hunrath. If you go up to the top of the tower you will see two lights now illuminated. Go to the Mayor's house and out the door that takes you to the dividing wall. Head along the path and go left onto the mesa. Go to the swap machine. Open the cover and press the button. When you arrive follow the path to the gate and listen to the welcome message and look at the map. As the bridge is broken, go to the right and follow the path up until you get to the two lamps on the right. Just past the lamps on the left is a small path. Follow this to a swap machine. Link back to Hunrath. You will be on the mesa and the rock bridge has now gone. 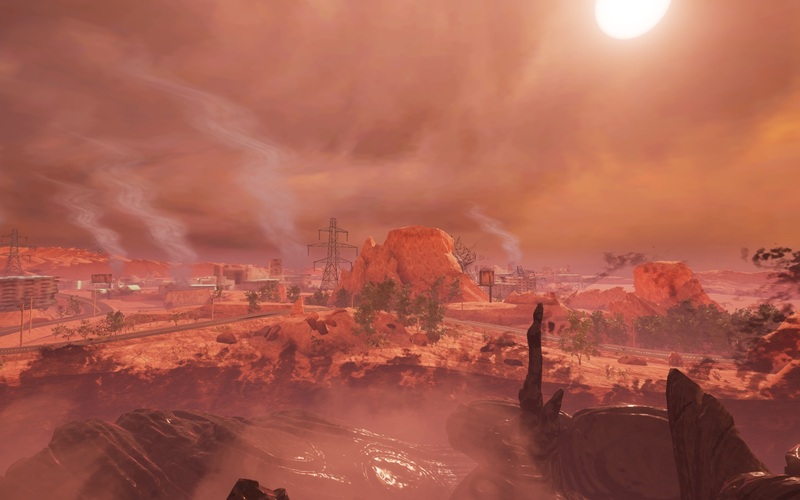 Walk back across the mesa to the other swap machine and return to Maray. Down the path, turn right and take the small path again. The rock bridge from Hunrath is now here and you can now cross to the other side. Carry on down the path to a crossroads. You may be able to see the red laser. Go left and up the ramp into the building. Up on the right is a Villein device. Use it to destroy the Mofang device. You can see two buildings. The dome on the left looks like it has an elevator going down to the lower paths. Turn around and listen the Mayor. Sounds a bit dodgy. Left will take you up and round the corner to a broken bridge where you can see the buildings you were just looking at. Return to the cross roads and go left and down into the forest. Cross through the membrane and along the path. Up above you can see some rails. Go through the membrane again. You are now in the building with the broken bridges. Go to the other end of the building and you can see the building with the Villein device you use to destroy the Mofang device. Either side are bridge controllers. You can use these to build bridges. The easiest way to do this is with a zigzag pattern. Press the button and a bridge will form. Build both. One bridge will lead back to the crossroads, the other to a dome. You are now going to be swapping back and forth a lot. Inside the dome are two swap machines. Use the far swap machine to return to the Hunrath scrapyard. If you haven't done so already go to the river gate and turn it so the walkway is on the opposite bank (saves a lot of time later). Now use the swap machine closest to the entrance to return to Maray. You can now exit the far side of the dome. Go down in the elevator. Exit left and follow the path up to another dome. Outside is a pair of buttons that rotates the dome (but don't move anything). Inside are three swap machines. Use the righthand swap machine to return to Hunrath. Go to the swap machine with the bridge controller and build a bridge. Cross over and read about the Gauntlet. Return to Maray with the bridge controller and build a bridge. Rotate the dome 180 degrees and build a bridge. Link to Hunrath with the bridge controller and build a bridge. Link to Maray. Cross to the new dome. Note the inner and outer domes. Link to Hunrath. This clears the inner dome from Maray. Cross to the triple swapper. Link to Maray (use any machine). Cross to the new dome to see a new swap machine. Link to Hunrath. This clears the outer dome but takes the inner dome back to Maray. Go to the triple swapper and link to Maray. Cross to the dome and link to Hunrath. Both domes are now here. Go to the triple swapper and link to Maray. Cross to the new dome and out the other side and follow the path to the elevator. Go up to the top and look down at the maze. There are three exits. You need to get to each of them. If you want a detailed solution with images click here. If not, here are the steps you need to take:. Rotate 90° anticlockwise > go down > swap > upstairs > go right to triple swappers > swap > up tower > rotate 180° > down > swap > upstairs > go right to triple swappers > swap > up tower > rotate 90° clockwise > down > swap > up stairs > rotate 180° > down > swap > up one level > run the maze > open the gate > return to tower > rotate 90° clockwise > down > swap > up stairs >rotate 90° > down > swap > rotate maze 90° clockwise > down > swap > up > rotate 90° anticlockwise > swap > up > rotate 180° > down one level > run the maze > follow path through the membrane twice > open the gate > return to tower > rotate 90° anticlockwise. Before you run the final maze go down and swap. Up the stairs and go left. Open the door and you should recognize where you are. If you opened the river gate correctly you can now follow the river to the tunnel entrance where you blasted the rocks a zillion years ago. Inside is a swap machine that takes you to Mofang. Follow the path round the crater and down the path to the left and you will end up at the tree. You may also discover a path that leads up to a view over a small town in America. Enter the tree and turn on the water. Leave the same way you came in (not the space paths) and return to the swap machine. Return to Hunrath, follow the river back into the tunnel. Swap back to Maray. Through the maze and up the ramp and then down the side ramp (don't go up into the building). Listen to the dodgy Mayor again. Press the button and watch the capsule rise. Go up both ramps into the building and enter the capsule to take a ride. As you arrive you may see some flashes of light - evidence that the fighting hasn't yet finished. Exit the building and go round the back. Look into the pit and see the platform rise. On the platform is a bridge controller. Leave the building to the right (as you face the bridge controller). You will see a small path to your right with a locked door. Follow the main path and enter what used to be a dome. There is an injured Villein on the left with a screen that says 222. Read the book on the other site of the dome and note the number for the Mayor. Use the door controller to open the door. Leave the dome and go to the small path. Follow the path, build a bridge and cross back to your arrival point. You need to translate the number 222. Head back to Hunrath and go the garage. Enter the number into the cash register and get the code. Head back to Maray and return to the building. Go to the pit, enter the code and press the button. You will descend and Jacob will appear in his suspension chamber. Break the links, press the button and rise back up. Return to the ruined dome. The dome exit will now be open. Go through and see the now dead faux mayor. Ahead of you is a Mofang sphere with a floating seed. Do not go anywhere near this. There were warnings about this in Hunrath. If you try to cross you will die and the game will end. Go up to the Villein device and blast the seed. You can now safely cross the Mofang sphere. Use the machine on the left to build a bridge. Cross over and go down to the river. . Enter the tree and go down to the roots. Turn on the water and follow the hose back to Hunrath. Climb back up and check the tower if you want. All four lights should be lit. Go see CW. He says that everything is nearly ready, you just need to set the explosives on the bleeder. Go up to his workshop, the door at the back should now be unblocked. Climb the ramp to the rock bridge. Cross over and go through the membrane. Follow the path to the bleeder and round the back. Open the cover and flip the switch up. Return to CW. Go up to CWs workshop and out along the rails. You can see the huge swap machine he has constructed. It looks big enough to take the whole of Hunrath back to Earth. This is where you need to make a decision. Do you heed Farley's warning about the battery or do you trust CW?. If you saw the cursed Earth back in Mofang you may not want to return. I took a copy of my saved game and did both. Once you have left the battery engaged or pulled the plug go to the top of the tower and press the plunger on the detonator. Depending on your choice one of two things will happen. I'll let you discover what they are.